A glamorous action thriller/heist film directed by Abbas-Mustan. Produced by Abbas-Mustan, Ramesh S. Taurani, Ronnie Screwala, Siddharth Roy Kapur. I played Armaan Malik, billionaire casino owner and former cage fighter. 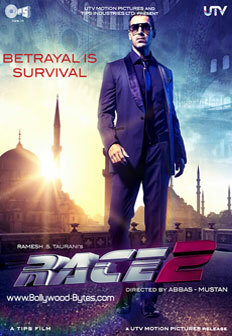 When a professional assassin makes an attempt on his life, wealthy player Ranvir Singh is set upon a road that takes him to Turkey and the glamorous world of casinos, card games, cage fights and race courses, where everyone has a hidden agenda and no one is quite who he (or she) appears. With danger and betrayal at every turn, is this a race he can even win? "This was the first film since 'Dhoom' that put me back in negative space as a cool villain. Someone who saw me in it said 'bad has never looked so good' and I think that's a plus."